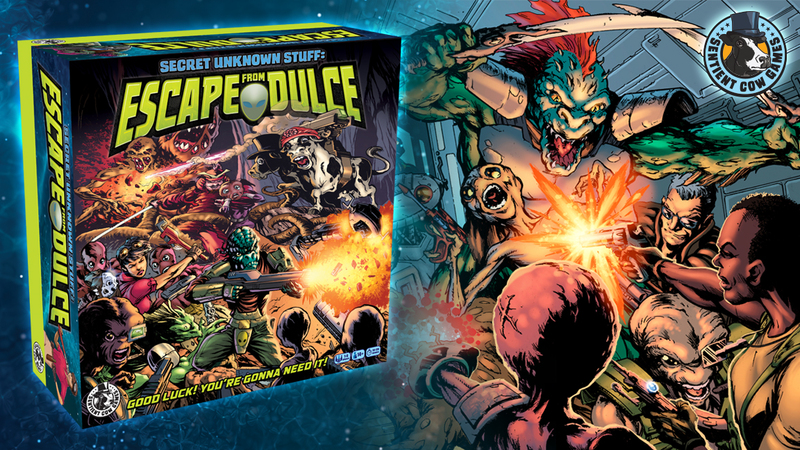 FAQ: Secret Unknown Stuff: Escape from Dulce - Co-op Sci-Fi Fun! Will the Expansion pack include Minis? Unfortunately, no minis will be included in the Expansion. They will be punchboard standees, but we are looking to get minis of Sir Reginald, Joey Fixit and the even the dreaded Umugatu down the line a bit. I really want this game, but I can't afford it right now. What can I do? Just pledge $1 before our campaign ends on April 1. As long as we hit our funding goal, you'll be given access to our pledge manager and will have the opportunity to adjust your pledge, and buy a copy of the game, after our campaign finishes. You will be notified of this from our pledge manager via email. Again, this will only be available if we hit our initial goal. Will you be doing translations for the game? We would love to, but need to see how many requests we get for these. If you would like the manual translated, please message us and let us know what language. Right now we’ve had a few request for French and Spanish. If we get enough requests and go over our goal, translating the game manual and making it available online, is something we will pursue. There’s a ton of components in this game. Will I be able to fit everything back in the box? Yes! We’ve built seven prototypes of this final version of the game and we don’t have any problems fitting everything back in the box. All of the leg supports for the game boards will be a one-time assembly to cut down on wear and tear, but this also increases the amount of space they will take up in the box. Additional components might be added depending on the stretch goals we hit, and these will obviously take up additional space. While we intend to have all stretches ship in the box, it might be hard to fit those assembled legs back in with everything else. Our solution to this is a fold out cardboard insert that will fit around the inside edge of the bottom of the box and pop the top of box up higher. This insert will take the box depth from 5 inches up to 6.5 or 7 inches giving you plenty of extra room to fit everything back in there. Is Escape from Dulce a true co-op game? Yes! Each player chooses one of the eight characters to play as, and all players will have to work together as a team to escape the base. No one has to play as the bad guys, as the bad guys run themselves. Every time your group enters a new room you’ll draw an encounter card. This card tells you how many and what kind of enemies you find in this room. Draw the appropriate enemy cards and put them on the Combat Tracker. Each enemy card is different and outlines that enemy’s attacks and who they will target for each attack. It could be the player with the highest accuracy, the lowest speed, or the highest armor rating. You’ll still need to roll for the enemies to see if they hit you, and move their pieces around the board, but nobody is in charge of them, and no one has to make decisions about who they will attack. Will the Expansion pack include Minis? I really want this game, but I can't afford it right now. What can I do? Will you be doing translations for the game? There’s a ton of components in this game. Will I be able to fit everything back in the box? Is Escape from Dulce a true co-op game? I want to know when my reward is shipping. I am having trouble filling out my survey. I would like to make a change to my pledge. I would like help with preorders. I have a issue with my pledge finances. I have a question for the project creator. I have a question not listed here. I want a refund for my initial campaign pledge. I have a question about BackerKit.